It’s been a long time coming, but the wait may soon be over. Fourteen years ago, artist Luther Vann and poet and author Aberjhani began a collaborative book project. More than 50 reproductions of Vann’s art and 40 of Aberjhani’s poems were put together in a book they titled Elemental. Both men are Savannah natives who have achieved considerable renown in their chosen fields, and the project was greeted with enthusiasm. It was accepted by local arts publisher Bonaventture Books, and a galley of the book was put together. But 14 years later, the book is still not published because of production costs. 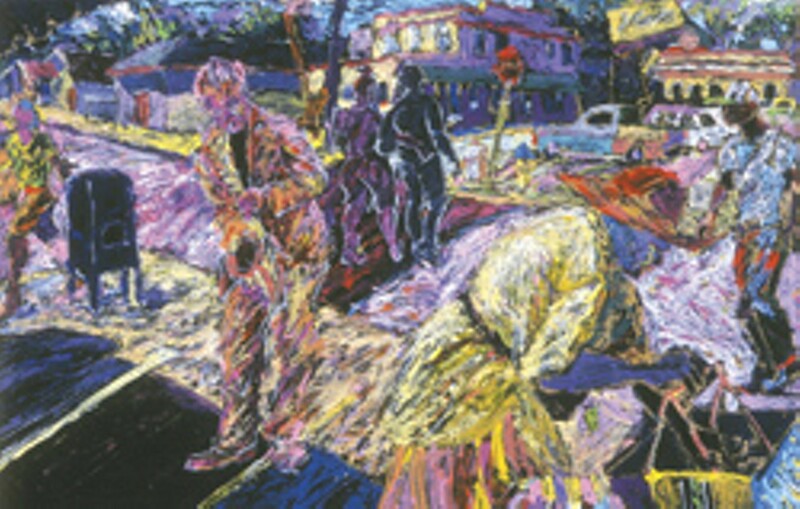 A member group of the Telfair Museum of Art, the Friends of African-American Arts, has issued a call for funding from the local community to get the book printed. The FAAA was founded a year ago to promote and support art by African Americans. “We also want to educate the community about African-American art,” Wilds says. If the fund-raising effort is successful, Elemental will be released next spring to coincide with the exhibition, Elemental: Paintings by Luther Vann. A little more than $15,000 is needed, and fund-raising will continue until Jan. 13. “We need it by the first of February so we can have it printed and ready in time to distribute it for the show,” Wilds says. Jefferson says getting the funding is the only obstacle. “It’s a done deal as far as getting the book ready,” she says. Vann was born in Savannah in 1937, but at the age of 6, was sent to New York City to live with his mother. He received his formal art training there but spent every summer in Savannah, which he considered his true home. Today, Vann is an internationally recognized artist, but still lives in the house built by his uncle. He’s in the process of building a new studio in the back yard. In 1991, Aberjhani encountered Vann’s work at an exhibition at the Beach Institute. He was so moved he began writing poetry expressing the powerful feelings the paintings inspired in him. Later, the two met by chance and immediately became friends. Aberjhani’s own works have been p published widely throughout the United States. He has received numerous honors and awards, including the MBWC Best History Book of 2005 Award for his Encyclopedia of the Harlem Renaissance. The publishing delay hasn’t been entirely bad. “There have been more poems written by me and more paintings by Luther,” Aberjhani says. Donations to raise printing costs for Elemental should be forwarded to: Barbara J. Evans, Director of Development, The Telfair Museum of art, Box 10081, Savannah, 31412. Donors should indicate on their checks that funds are being donated for Elemental.